Full title: 'Accurata delineatio celeberrimae Regionis Ludovicianae vel Gallice Louisiane ol. Cauad' et Floridae adpellatione in Septemtrionali America'. In the upper left-hand corner of the map, there is an inset map of the Louisiana coastline, from the Mississippi Delta to the Florida peninsular. The cartouche represents the story of the "Mississippi Bubble," a stock scandal that financially ruined many Europeans in the early 1700s. The wealthy investors are buying stocks from winged cherubs while standing to the left of a statue of Faith, who is pouring riches out of a large cornucopia. Several more cherubs are seated, cutting piles of paper into stock shares. To the right of the statue, a group of impoverished, cheated investors watches sadly as a cherub dangles an empty purse before them. Small children are blowing soap bubbles from pipes. 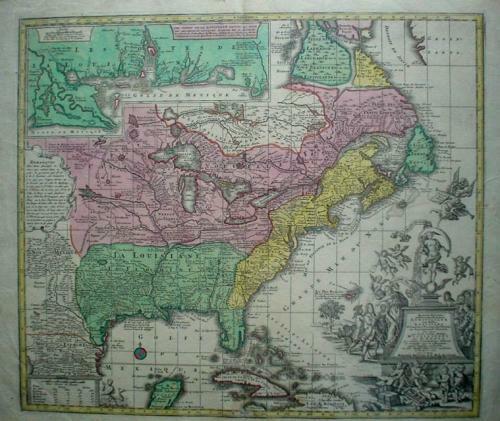 This map is in excellent condition with original hand coloring. The paper is clean and strong with wide margins. There are no discernible faults except for a small expertly repaired tear that is inside the image area. This does not detract from the overall effect of the map and is invisible from the front of the image.